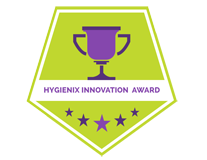 HYGIENIX Innovation Award™ recognizes and rewards innovation within the entire disposable absorbent hygiene value chain that utilizes nonwoven fabric or technology in a way that expands the usage of nonwovens. Presented annually at the HYGIENIX™ Conference, eligible categories include, but are not limited to: raw materials, roll goods, converting, packaging, active ingredients, binders, additives and end-use products. Companies are encouraged to nominate their own product(s) for the HYGIENIX Innovation Award™, but only one (1) product per company will be selected as a finalist. Tampliner®, an organic cotton tampon with a built-in mini-liner with a patented virtual applicator for clean insertion, removal and protection against leaks. Introducing ALYNE™ a brand-new product, that totally manages fluid absorption in a different than any other protective underwear! ALYNE DIAMOND QUILT™ employs multiple layers of different SAPs that absorb at different rates, from quick absorption to complete absorption without the bulkiness! How it works is the SAP layers are Diamond Quilted in a pocketed structure, sandwiched between layers of polypropylene spunbond and then ultrasonically bonded together. This adds stability, excellent SAP absorbency management, thinness, dryness and does not feel like the wearer is wearing a wet sponge. Using patented technology developed by SHE to make an absorbent core from banana tree agricultural waste, Go!™ Pads maintain superior absorption without using any chemicals and super-absorbent polymers. SHE employs hundreds of local women through local sourcing of banana fibers and pad production while delivering an affordable product to girls, primarily in East Africa, who normally wouldn't be able to afford pads causing significant costs to their education, health, productivity, and dignity. This breakthrough process will be used to develop a range of essential health products that address overlooked and taboo health issues, according to SHE.